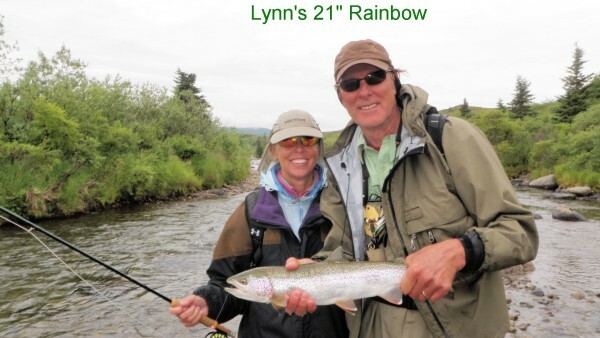 Rick Barry (right, with his wife, Lynn) has become a passionate fly angler. The following story appears in the December issue of California Sportsman. Photos courtesy of Rick Barry and Wikimedia. Basketball Hall of Famer and longtime Golden State Warrior Rick Barry famously – and damn successfully – shot his free throws underhanded. He’s spoken out about the frequent misses of noted NBA stars but dreadful foul shooters such as now retired Shaquille O’Neal and current stars Dwight Howard and DeAndre Jordan. He’s wondered aloud why those who clank free throws so frequently don’t follow his unconventional form that connected on about 90 percent of his attempts, fourth best in league history. Shooting free throws is nothing, Barry says; he would love to get those guys to try casting flies on an Alaskan river. “It’s much more difficult,” Barry interrupts when asked to compare the two artforms. One was one of the trademarks in a brilliant basketball career that saw Barry named one of the NBA’s 50 greatest players when the league celebrated its silver anniversary in 1996. The other has become a passion for the 71-year-old, who hosts fishing adventures to Alaska and Baja through his website, rickbarry24.com. And it’s a pastime Barry has only recently discovered and became smitten with. Barry was named one of the NBA’s 50 Best Players during the league’s 50th anniversary season in 1996. 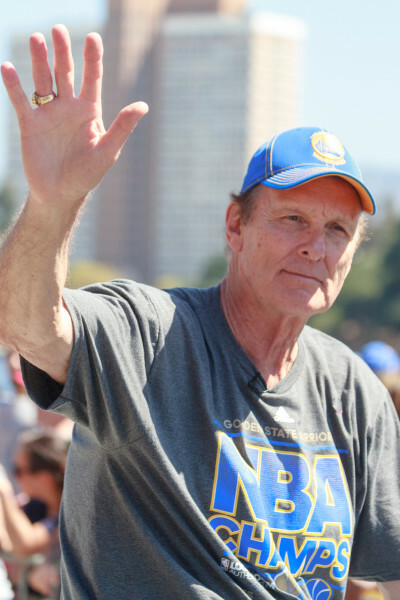 DON’T LET THE age fool you: Rick Barry is active and fit, despite being on the north side of 70 years old. His playing career ended in 1980, but he stayed busy with various business ventures. He successfully found a niche in broadcasting and as an opinionated sports talk radio host on KNBR in San Francisco and reveled in the role of proud papa watching his children play basketball at both the major college and professional levels. Until eight years ago, he mostly spent his free time on the golf course and as a road and mountain bike rider. The latter passion is one he rarely partakes in these days after suffering a serious injury accident last year near his Colorado home. “I’ll never go fast on a bicycle again,” he says of the crash that fractured his pelvis in five places. But fly fishing keeps him busy enough anyway. A friend’s offer almost a decade ago was a game-changing moment. Barry’s previous fishing experiences were minimal and unremarkable, so it wasn’t like he was in a rush to get back out onto the water. Still, he accepted Minnich’s invitation. And something seemed to click; perhaps it was his competitive streak as a former jock still fueled by something actionable. Despite the degree of difficulty casting flies, Barry was hooked. Minnich proved to be a fine mentor in terms of Barry getting the hang of a fly rod. Over the years, he’s picked the brains of guides who’ve hosted fishing trips. The basketball player in him sees the coaching side of the experts who have fished a lot longer than he has. So whenever he meets a new fisherman, he lets them know to not be bashful when they see him doing something wrong on the river. Pointers are always welcome. Still, Alaska is where this fly fisherman feels most at peace. BARRY’S FIRST TRIP to Alaska was not for fishing but golf. He played in a charity tournament in the Anchorage area. One day while there he was invited to fish and managed to catch a king salmon, but had to be told by the floatplane pilot it was landed out of season. But fishing with his friend Minnich convinced Barry he wanted more and to experience fishing more often. He looked around for an Alaska lodge that offered what he wanted. He ultimately began regularly visiting Rainbow River Lodge at Bristol Bay’s Lake Iliamna. Barry also set up a salt- and freshwater trip to Boardwalk Lodge on Prince of Wales Island along the state’s southeastern panhandle. Barry knows he’s in heaven for an angler when he’ll head out with his group to fish and the only other fellow visitors that day is the wildlife sharing the river. He’s seen more bears than other people in all his years fishing Alaska’s rivers. Once, Barry was filming an Alaskan outdoors TV show with his friend, former Major League Baseball pitcher Randy Jones. Between shoots they decided to join in the combat fishing chaos of the state’s popular Kenai River during a salmon run. It was blatantly obvious which scene Barry preferred. About the only negative he has to say about Alaska is he wishes the Wi-Fi were stronger so he could better enjoy another pastime: watching movies and his favorite TV shows on Netflix. But then Barry remembers he’s “in the middle of nowhere,” in a place where he can make cast after cast and bring in fish after fish. Lynn hasn’t caught the bug, but she did accompany her husband on a three-night trip they bid successfully on during a charity auction. They had to hike for an hour on Alaska tundra before finally reaching a stream. They saw all of two other human beings the entire duration of the trip. With so little fishing pressure, Barry managed to hook 35 rainbow trout and about 20 grayling on dry flies. Of the trout he caught and released, about 30 measured 20 or more inches. Even Lynn managed to catch almost two dozen grayling. This was paradise, about a million metaphorical miles away from the congestion on the Kenai – another reason why Barry keeps returning every chance he gets. Someday, he’ll catch a 30-inch rainbow. But he’ll enjoy all of the smaller and even too-small fish along the way. THE BARRY FAMILY is to basketball what the Barrymores are to acting, the Wallendas to high-wire acrobatics and the Kardashians/Jenners to reality TV stardom. Of Barry’s six kids, only daughter Shannon never got involved in playing basketball. Rick was known for his unique but rarely copied foul shooting technique (son Canyon shoots his free throws underhanded for his current college team). The family patriarch’s fabulous career included more than 25,000 points scored, a Rookie of the Year award, an NBA Finals MVP award for the 1975 champion Warriors and five first-team All-NBA seasons. Lynn, who is Canyon’s mom, was a star basketball player at the College of William and Mary and later remained in the game as a coach and administrator. There are also four older Barry sons: Scooter won an NCAA title at the University of Kansas and spent many years playing abroad in pro leagues. Drew is his college alma mater’s (Georgia Tech) all-time leader in assists and played for four NBA teams. Jon (ESPN) and Brent (TNT) are successful TV analysts who also had lengthy pro careers (Brent Barry also won the NBA Slam Dunk Contest in 1996). Scooter, Jon, Brent and Drew all attended Concord’s De La Salle High School. And who knows? Rick Barry said events happen in threes; his sons all played basketball at a high level just as he did. At one time or another, Scooter and Brent also dabbled in broadcasting like their dad and brothers have on a full-time basis. “Hell, the third thing can be that they all become fly fishermen,” Rick says. 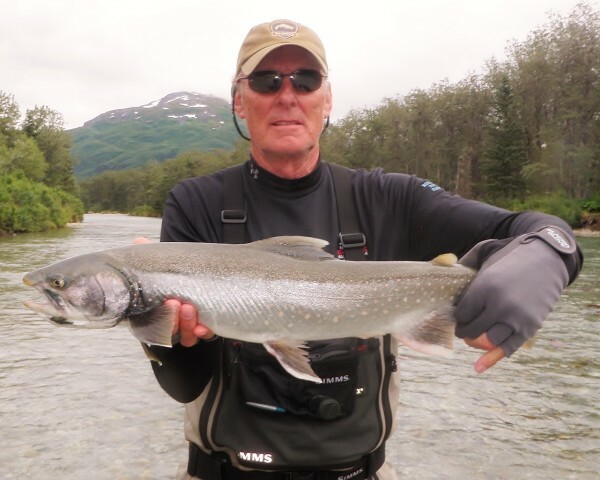 Still, there is no shortage of sports royalty for Rick Barry to head up to Alaska with. There is World Golf Hall of Famer Raymond Floyd, who fished with Barry in Alaska this summer. 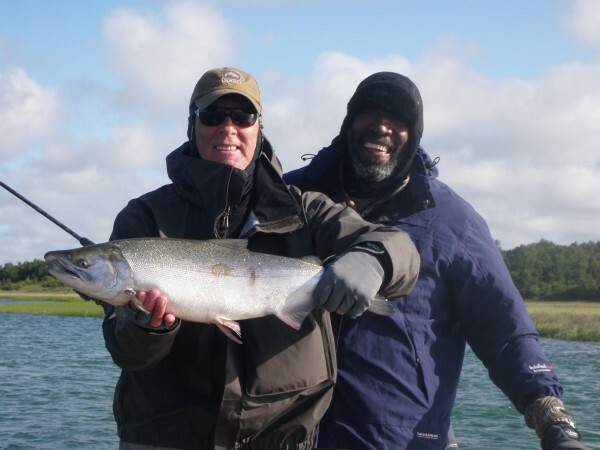 One of Barry’s closest friends, former Warriors teammate Clifford Ray (see sidebar), is a regular fishing partner who went with Barry on a trip to Sitka and to Prince of Wales Island in August. Even legendary NBA/ABA star George Gervin, who was known as “The Iceman” during a Hall of Fame career, got in on the action. That spurred a joking twinge of disdain from Barry about these two hoops gunslingers meeting in Alaska. “George is a spincaster. He didn’t have any waders or boots. But he came up with his son (and a couple others) and we did mostly saltwater fishing and we did some freshwater too. We had a good time,” Barry says, recalling that not many old basketball war stories were swapped. But The Iceman did get in a memorable photobomb. Barry at the Warriors’ 2015 NBA championship parade in Oakland. THE SAN FRANCISCO BAY Area’s pro basketball scene came full circle on June 19. On a sun-splashed morning in Oakland, the city celebrated the Golden State Warriors’ NBA title victory parade. 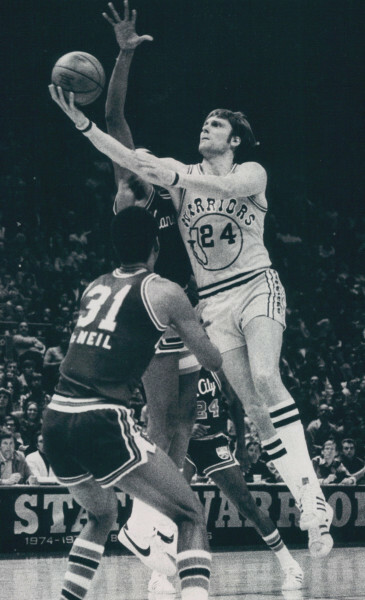 Besides the current team – led by league Most Valuable Player Stephen Curry – also involved were some of the franchise’s past stars, including arguably its greatest player, Rick Barry. He was the 1975 NBA Finals MVP when the Warriors won their only other championship since moving west from Philadelphia in 1963. Barry, who lives in Colorado but has spent a lot of post-NBA time in the Bay Area – including a stint hosting a popular sports radio show – initially was leery about attending the parade when the organization asked him and others from the team’s past to participate. “I told them when they asked me, ‘There’s no reason for me to be at the parade.’ They said they wanted to (bring back) the history and have the guys there,” said Barry, who was joined by several of his former teammates and the team’s 1975 head coach, Al Attles. Yet Barry and other former players are still revered by Golden State’s fan base, which has been among the most loyal – and perhaps longest suffering – of all the teams in the San Francisco/Oakland/San Jose area. Barry received a loud cheer from the estimated crowd of 500,000 when he was announced. “I was just happy for the new ownership and the fans more than anything else,” says Barry, who publicly chastised Golden State fans when he jumped on the microphone in 2012 and defended co-owner Joe Lacob. He was booed loudly by the Oracle Arena crowd during that ceremony to retire the jersey number of former Warriors player Chris Mullin. Admittedly, the team had gone through years of mediocrity and bad basketball, but Barry angrily called out the haters that night. And just three years later Golden State won its first championship in 40 years, when Barry led the way. On Oct. 27, the Warriors opened defense of their championship by hosting the New Orleans Pelicans. Before tipoff, the team was awarded their title rings and the banner was unveiled at Oracle. A representative from each of the franchise’s championships was also honored. It was a no-brainer who from the 1975 team would appear: Rick Barry. He’ll always have a soft spot for where he had the best days of his fantastic basketball career. Barry makes regular fishing trips to Alaska these days. THE FISHING IN Alaska can be so prolific that Barry sometimes gets spoiled. “You catch so many fish and it’s so beautiful. It’s such a special time when you’re up there, get away from everything and get into nature and God’s beauty and be hooking into a lot of fish,” he says. While the guide was skeptical there was enough room to get a cast in that space, Barry wanted to give it a shot. “Let me try,” he said. Still, catching fish is what the sport is all about. In basketball, the name of the game is ultimately getting the ball through the hoop. Some anglers go to Alaska hoping to catch that once-in-a-generation trophy salmon, trout or halibut. But Barry is more about quantity than quality. He’s perfectly fine with a catch-and-release day where he’s constantly landing fish, size be damned. And he’s done so through hours upon hours of casts during annual trips to Alaska (his bike wreck prevented going up in 2014). Barry loves to share stories of an endless cycle of casts, bites, and catch-and-release action. A couple years ago, Barry was at his beloved Rainbow River Lodge on a solo trip with a group he wasn’t familiar with. Every day he’d go out and was asked upon the return how he did. He’d caught “about 100” on the first day. There are more awaiting him for years to come. 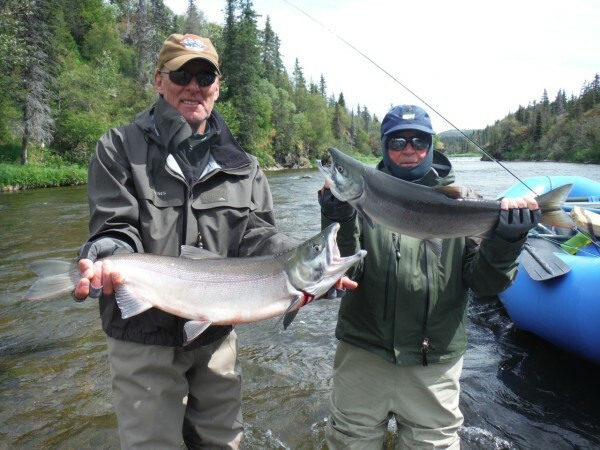 Editor’s note: More info on Rick Barry’s fishing trips can be found atrickbarry24.com. You can follow him on Twitter (@Rick24Barry). Rick Barry (left) and Clifford Ray are former teammates, close friends and fishing partners. 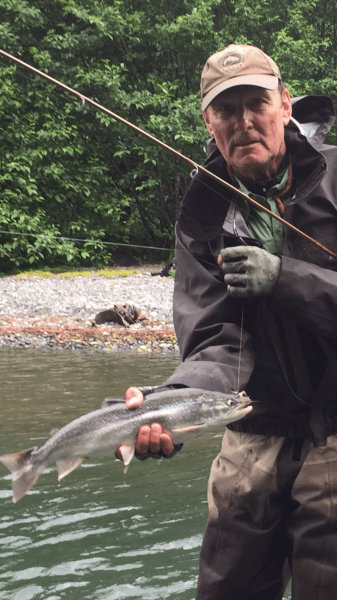 If there’s one thing best friends Rick Barry and Clifford Ray haven’t seen eye to eye on, it’s that the former loves to fly fish and the latter prefers a spinning rod on the water. Barry, teammates with Ray on Golden State’s 1975 NBA championship team and now best friends, has tried to convince Ray to start casting flies. Ray, a rugged, tough-as-sandpaper post player who averaged nearly a double-double (9.4 points, 10.6 rebounds) during Golden State’s 1975 title run, is almost as passionate about fishing as his buddy. Just not so much for casting flies. On one of their trips, Ray’s son came along and “Everett is hooked on fly fishing,” Barry said proudly.